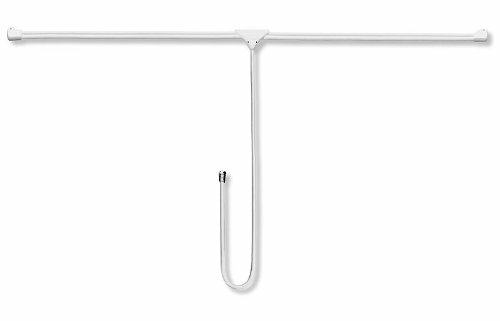 At first glance the C. Crane FM Reflect Antenna (originally $35 but recently reduced to $19.95) looks like a piece of white plastic tubing. In reality it is a specially designed folded dipole antenna cut for the FM band (88 – 108 MHz) housed in a semi-rigid yet bendable sheath which makes it easier to position where it will work most effectively. But there’s more to the design of the FM Reflect than meets the eye. First though, let’s backtrack a bit. As TV and radio equipment moved away from 300 ohm antennas to 75 ohm, single wire (non-folded) dipoles became the norm as they were inherently 75 ohm impedance…and the wire was cheaper than twinlead which was becoming more scarce. Still there was a lot of loss in these antennas. 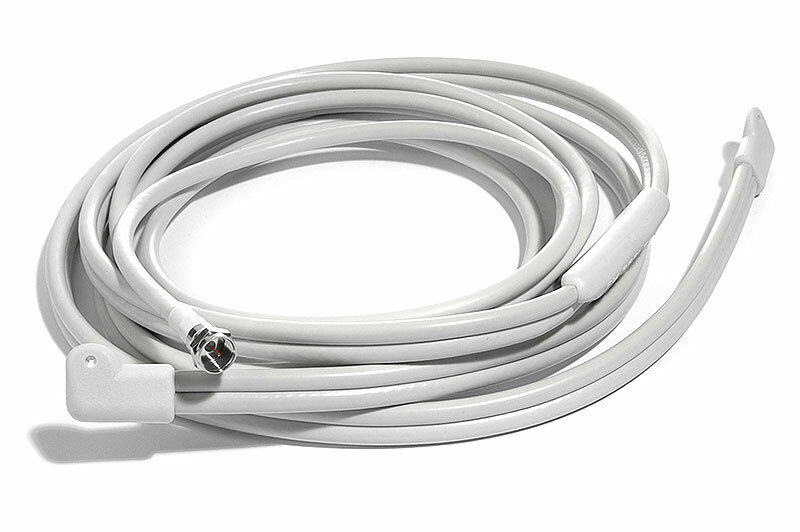 More recently manufacturers have gotten even cheaper supplying short pieces of plain wire to serve as the FM antenna…these work after a fashion in stronger signal areas but deliver less signal than a dipole. With the advent of FM HD more and more people found these simple wires inadequate to receive FM HD signals as well as they receive regular analog FM signals. Meanwhile portable and table radios with FM have their own problems. Portables have to contend with a whip antenna, also known as a monopole, while table radios generally use the AC line cord capacitively coupled to the FM tuner. Again both methods work reasonably well but neither gives as strong a signal as a dipole antenna. Enter the C.Crane FM Reflect Antenna. The C. Crane FM Reflect Antenna is a wolf in sheep’s clothing. 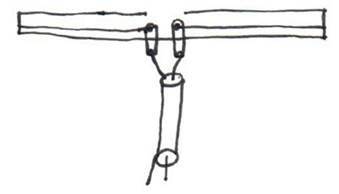 Yes it is a folded dipole but with several important differences. First, it has a 54” inch all copper element for less loss and what C.Crane calls a copper follower which acts as a stub, somewhat in the manner of a J-Pole antenna – thus the name FM Reflect. This tunes the design to 75 ohms. There is an additional element parallel to the dipole which adds girth to the dipole elements which broadens the frequency response. The 8 foot downlead is also all copper. As a result the FM Reflect offers flatter coverage of the FM band with no fall off in response near the frequency extremes and less loss. You can also shape it into a circle and get 3 db of gain which could be the make or break on a marginal signal. On a direct comparison with a standard dipole you will get a slightly stronger signal, and because of its semi-rigid construction it is easy to position and shape it so it works best in your situation. It is also far superior to any gadgety amplified FM indoor antenna…stay away from those…they amplify nose as well as signal and don’t perform as well as a passive wire dipole. In Use: I was intrigued by the theory of the design but also curious to see if I could really tell the difference in actual use, and I must say I was impressed as soon as I took it out of the box. The FM Reflect has an 8-foot feed line and is fitted with an “F” connector for direct 75 ohm connection to most modern equipment, and it also comes with a balun with spade lugs for 300 ohm use and an alligator clip to clip to the whip of portable FM radios. It feels rugged and solid and although pliable enough to be bent into any configuration it is stiff enough to hold its shape which makes deploying it as easy as can be. Normally it should be stretched out straight and positioned broadside to the signals you wish to receive but this general rule is not always practical or even best in every situation so experimentation is the key. C. Crane advises trying this: bending it into a circle to increase the gain for circularly polarized signals (which most stations are these days). I had two situations where I wanted to see if the FM Reflect would do better than the plain wire antennas I was using already. In the first scenario I was using a plain wire dipole antenna for my home AV system but I was having trouble receiving a clean signal on one particular station. The station was listenable but in stereo there was sometimes a slight hiss and it might fade as I moved around the room…this is common with indoor antennas when signals are marginal. The FM Reflect completely solved the problem for me. I found a position where it worked perfectly and was able to make the antenna stay put where it worked best…something I could not achieve with the plain wire I had been using. Stereo with no background hiss and it does not fluctuate when I move around the room…a very noticeable improvement. I also tried it with a few portable radios which had FM antenna jacks and as expected it greatly outperformed the whip antennas on both of those radios. If you are an FM lover and wish you could get a bit more reception out of your FM portable the FM Reflect should do it for you. If your portable doesn’t have FM antenna terminals C.Crane suggests using the supplied alligator clip to connect the antenna to the radio’s whip…I didn’t try that type of connection but suspect it should work well. An alternative connection would be to connect one lead of the antenna to the whip and the other to a ground point on the radio…that might be worth trying as well. Bottom Line: Unless you able to put up a roof mounted antenna and perhaps a rotator, the FM Reflect Antenna will give you FM reception that is as good as it gets with an indoor FM antenna. Time has proven that dipoles are efficient FM antennas, and the FM Reflect is more efficient than a standard dipole and easier to use…it is a dipole on steroids. Everything old is new again!